You can see them and all their PeaceLoveMom goodies at Delaney's Womens Boutique Shoppe. They have three locations on the north side of Indianapolis. My New Year's Resolution for this year is like most others. To lose weight and get back into shape. With the help of my son, and his never ending energy, I am hoping to succeed shortly! PLM – You look great to us. Boys are a Blast! 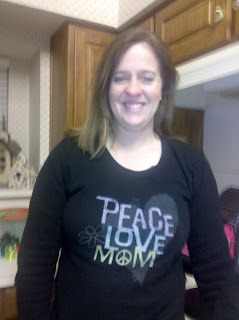 I love my peacelovemom shirts!!! mine is an original, haha my resolution for the new year is to spend more quality time with my kids. PLM – Thanks for being a PeaceLoveMom fan for soooo long. Still looks great. My resolution: to have more fun with my boys! My New Year's resolution is to have more fun with my boys! PLM – What a great photo. It already looks like you are accomplishing your goal. PLM- Loving yourself sounds so easy to say, but we know it is harder to do. One of our goals everyday of every year. Love yourself first and the rest will just come. My name is Shannon-stay at home mom to our 19 month old daughter Meadow. My resolution for 2010 is to get some REST!!!!!!! PLM- There is no rest in Motherhood, but we love the idea that you think there might be. Please prove us wrong and show us how to do it! My New Year's resolution for 2010 is to stop procrastinating (e.g. 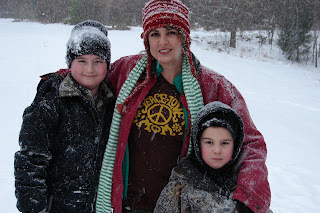 waiting until the last day to send in my resolution to PeaceLoveMom)! Instead, I want to carpe diem and enjoy life more with my 3-year-old and 1-year-old daughters. PLM – Your photo is soooo cute. It was worth the wait to see. Thanks for sending! 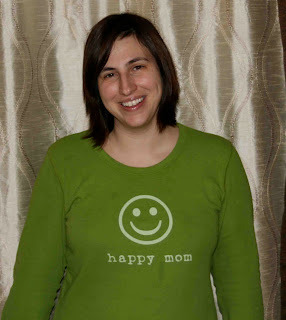 I love my Happy Mom shirt :) Here's a picture of myself wearing it and my New Year's Resolution is to lose all the pregnancy weight!! (Baby was born Dec. 27th, 2009)! PLM – Congrats on the new baby. Way to end 2009 on a high note and get an extra tax deduction :) You look great to us! One of my new year's resolutions is to drink more water! 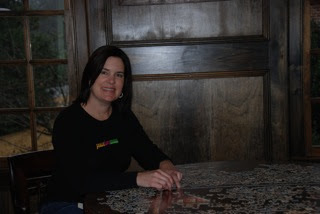 I wear my PLM shirts several times a week - they are the best! Here is a photo of me in my Lucky Mom t-shirt at the nonprofit organization Feed My Starving Children in Aurora, IL. One of my new years resolutions is to give back more, and we spent our new years weekend as a family at this organization, packing nutritious meals to be shipped overseas to areas where poverty and hunger have devastated whole generations of children. One of the organizations main recipients is Haiti; little did we know how timely our involvement this January would be. Thanks so much for providing quality, comfortable clothing that advertises and articulates our gratitude for our blessings so well! PLM – Thank you for making a difference in the world and teaching your children the value of giving. We are honored that you chose to wear a PLM tee when you are doing such important and meaningful work. I love all my PLM shirts and am excited to get another one! One of my New Year’s resolutions is to spend less time on the computer and more time with my family.